Considering the strong resentment expressed by Tibetans toward the rebranding of the Tibetan Government-in-Exile as the “Tibetan People's Organization”, it is surprising that this decision has not been further challenged. This is particularly remarkable if one considers that the justifications later provided by Dharamshala were taken at face value by most people, without the slightest reservation. How can rebranding appease Tibet’s critics when, from all evidence, their prime concern is not the name of the government but its political activities? How can a “subtlety” of the Tibetan language interest anyone apart from Tibetans and, I have no doubt, the Chinese Government? There is no rational answer. Dharamshala’s bizarre assumption that if the name of its government is changed everything will be safe is akin to saying that if broccoli is renamed “chocolate” children will happily eat it, or that if nuclear energy is rebranded “sustainable energy” environmental activists will refrain from campaigning against it. The core issue is not whether the word “government” sounds acceptable, but whether Tibetans need a national government under the umbrella of the Middle Way Approach and within “the framework of the PRC Constitution”. When the Dalai Lama promotes autonomy and ensures Chinese audiences that there is no such things as a “Government-in-Exile” but only a “Central Administration” (Duowei, May 2010), or that his administration “never used the word government” (Radio Australia’s Chinese service, June 2011), he is still talking exclusively about the political entity to which these titles refer, since in the eyes of most Chinese any form of government is a disguised claim of independence. As such, and only as such, can this rebranding be justified. But Dharamshala chose once again to evade the truth and came out with two sets of arguments aimed at justifying this suicidal move and at denying allegations that the government had given up its mandate. These interventions spared no effort to downplay the importance of the name change. The first, branded as the “Kashag’s Clarification”, was an address from the outgoing Prime Minister Prof. Samdhong on 2 June 2011, during the first session of the newly elected Parliament and broadcasted on the government’s TV channel (later officially transcribed in Tibetan and translated in English). The second came as a commentary from the Dalai Lama’s Envoy Kelsang Gyaltsen on 20 June, published in English on the Envoy’s Office website and reprinted the following day in Tibetan and Chinese on The Tibet Post site. Given the number of misleading arguments and fallacies involved in these rationales — and to encourage readers to consider the motives invoked with the utmost care — I shall attempt here to analyze Prof. Samdhong’s and Kelsang Gyaltsen’s key arguments. I do not apologize for the length of this essay; there are circumstances in which statements and references are worth extended consideration, particularly when a nation’s survival is at stake. The first disingenuous approach is to say, “Changing the name of the government is not a sign of capitulation since the Dalai Lama’s resignation gives more power to the elected leaders.” This argument deliberately refuses to address directly the opposition to the name change: it presents the problem as a package deal where one grievance (rebranding) can only exist because of the other (resignation), as if there was a causal relationship between a devolution of power and the need for weakening the government’s image. Yet there is a clear difference between the two; even if most Tibetans have somehow resigned themselves to accepting that the Dalai Lama is no longer their political leader, that is not the case regarding the renaming of their government. The government name was changed as a preventive measure. The Dalai Lama’s resignation brings more power to elected leaders. Therefore the government is more democratic and stronger than ever. Examining this “reasoning”, it is not difficult to realize that the conclusion (3) is not relevant to the name change (1) but exclusively to the Dalai Lama’s resignation (2). The government’s official name in English has always been “Central Tibetan Administration” (CTA). People in Tibet regard the CTA as their true authority. Only the people of Tibet can decide whom they recognize as their true representative. Therefore, if an individual living in exile considers the CTA to be a non-governmental organization it is his or her individual opinion and nothing more. In this argument, (1), (2) and (3) are supposed to be dependent reasons in support of (4). But there is no inference between (1) and (2) — it is not because of its English name that people in Tibet regard the Government-in-Exile as their true authority — nor is there any inference between (2-3) and (4). Such dishonest argumentation also conveniently ignores the likelihood that Tibetans in occupied Tibet may not welcome this rebranding, and Kelsang Gyaltsen’s claim that it is “the small Tibetan world in exile” that is “torn apart by an emotional and political dispute” is disingenuous: a friend of mine who was in Beijing during these constitutional amendments reported to me that none of his Tibetan friends living in the Chinese capital supported the name change. The third misleading argument (and probably the most revolting) is to say, “Discarding the word ‘government’ is not a big issue since Dharamshala does not seek legal or political recognition as ‘the Tibetan Government-in-Exile’.” This assertion from Kelsang Gyaltsen is definitely not true, except for India where the official “Central Tibetan Administration” terminology applies. It shows, nonetheless, the extent to which Dharamshala seems prepared to go to justify surrendering the Tibetan nation. A few years ago, Gyari Dolma, Tibet’s most senior woman politician in exile, noted that the parliament’s long-standing mission was “to reach out and seek support of respective parliaments of different countries in order to gain more legitimate recognition of the Dalai Lama-led Tibetan Government-in-Exile.” The parliament itself submitted a petition to the Government of India in July 1972, seeking formal recognition. But even in the event that diplomatic recognition would not have been sought directly by the Tibetan Government, it was done, until recently at least, with its full consent and blessing, with no complaint from Dharamshala regarding the use of the term “Government-in-Exile”. Thus, no later than November of last year, delegates to the Sixth Tibet Support Group Conference (attended by Prof. Samdhong) agreed to continue to work to achieve formal recognition of the Tibetan Government-in-Exile in the international community. In fact, ever since Tibet regained the international spotlight in 1987, diplomatic recognition has been actively sought through Tibet support groups and foreign parliamentarians. In July 2000 the European Parliament adopted a resolution calling on the governments of the Member States “to give serious consideration to the possibility of recognizing the Tibetan Government-in-Exile as the legitimate representative of the Tibetan people” if, by 2003, Beijing and Dharamshala had not signed an agreement on a new statute for Tibet. To date this resolution continues to be ignored, despite on-going efforts from Tibetan delegates and friends, but the European Parliament nevertheless continues to refer to Dharamshala as the “Tibetan Government-in-Exile”. The World Parliamentarians’ Convention on Tibet (WPCT) has also been seeking diplomatic recognition for the government for many years. During its last convention held in Rome in 2009 (attended by 18 members of the Tibetan parliament, including Speaker Penpa Tsering and Prof. Samdhong), the WPCT reaffirmed “the resolutions and declarations made at all previous World Parliamentarians’ Conferences on Tibet, including the recognition of His Holiness the Dalai Lama and the Tibetan Government-in-Exile as the legitimate representatives of the Tibetan people.” The Tibetan Government has even been granted official recognition, although by states that are themselves not acknowledged: in 1995 the Unrepresented Nations and Peoples Organization (UNPO) recognized “the democratically-elected Tibetan Government-in-Exile” as “the sole and legitimate representative of the six million Tibetan people.” What is interesting about the UNPO is that Tibet is a member State and its representatives must have agreed with the exact wording of the resolution. Tibet is not just a member, mind you: it is one of the UNPO founding Member States and took over its eighteen-month rotating presidency in May 2010. Finally, the new Prime Minister Dr. Lobsang Sangay himself declared during his campaign: “It is important that we explore ways to have the Tibetan Government-in-Exile be formally recognized.” He recently cooled down his words, saying that “if we are recognized we will welcome it, but we are not making deliberate efforts towards that goal”, but this position may change again, depending on circumstances. In addition to these misleading arguments, three specific threats are being used to defend this rebranding. The first involves the Friedrich Naumann Foundation (FNF), a German institution promoting individual freedom and liberalism. According to Prof. Samdhong, using the word “government” would have caused the FNF funds allocated for the Tibetan Parliamentary and Policy Research Centre’s (TPPRC) to drop by “almost 100%” (brgya-cha gang-tsam zhig) and brought about a decision to stop funding Tibet Support Group (TSG) conferences. As far as I have been informed by the Foundation, this assertion is completely unfounded and the inference has prompted the FNF to ask for clarification. The TPPRC’s funding has in fact remained at pretty much the same level since 2008, which, it is worth noting, was the highest in the last decade. This false claim is harder to digest if we consider that Prof. Samdhong is TPPRC’s co-chairman and Penpa Tsering (present when this claim was made) its chairman; with such positions, the two can hardly be ignorant of FNF’s funding policies. As for the TSG conference funds, that is another story altogether. Officially, according to the FNF’s office in Delhi, this decision had primarily to do with the high costs of these conferences, equivalent to the FNF’s annual budget for a full-fledged country project; the foundation had already announced in 2003 that it would not be able to fund the TSG conferences forever. But this decision has also to do with the shutting down of FNF’s office in Beijing. In 1996, at the time of the Second TSG Conference, the Foundation refused to comply with Chinese ultimatums to either cancel the conference or risk the closure of its Beijing office. The FNF still wishes to re-open this office and the new chairman, elected in 2006, might be more inclined to accept some kind of adjustments to that end. Some sources, however, would partly corroborate Prof. Samdhong’s allegation. Although it is difficult to get details about this, it appears that the FNF, under pressure from Beijing, would have threatened to stop funding TSG conferences if efforts toward enforcing the European Parliament’s resolution of July 2000 were not discontinued. This demand would have been categorically rejected by at least one senior Tibetan official who declared that Tibetans would rather terminate the partnership than comply. But to get the full measure of the perverse logic of Prof. Samdhong’s argument, it is sufficient to simply apply it to a similar case: in December 2005, once again under pressure from Beijing, the European Union suspended ApTibet’s operations because of its link to the Dalai Lama. It then attempted, without success, to demand repayment of the EUR 451,000 it had provided for a project that was successfully implemented in Bayen County, Amdo. Does this mean that the name of the Dalai Lama should be changed in order to ensure foreign grants in the future? The second threat presented by Prof. Samdhong involves legal cases before the High Court of Himachal Pradesh (the original Tibetan statement specifies no case numbers). Although he does not elaborate on this, we are supposed to understand that some legal actions are threatening the political activities of the Tibetan Government. Many cases have been brought against Tibetan refugees in the Indian state of Himachal, but almost all of them involve benami (proxy-purchased) properties, illegal under Himachal laws, or investigations into the sources of large amounts of foreign currencies held by Tibetans (such as was the case with the Karmapa’s Trust which, alone, provoked the fury of Himachal’s chief minister). For the most part, these cases are handled by the Department of Revenue, under the umbrella of the Ministry of Finance, with no jurisdiction over foreign affairs or refugees. The only known case against the political activities of the Tibetan Government is actually the work of a single man, a certain Pawan Kumar (not to be confused with Sikkim’s chief minister) from Rewalsar. In November 2010, Kumar petitioned to ban the Tibetan national flag from government offices, monasteries and other institutions, in addition to seeking an inquiry into illegal land purchases around the holy lake of Tso Pema. Here, however, the outgoing Prime Minister is making a mountain out of a molehill: despite the fact that Pawan Kumar put forward another petition in March 2011, this time against the Karmapa’s Trust, he is an individual with limited powers and seemingly no political support, someone backed by a local lawyer who has a personal score to settle. In addition, Kumar’s first petition is not concerned with the name of the Tibetan Government but with the Tibetan national flag. Does this mean that Dharamshala is also prepared to ban all governmental emblems displaying the two snow lions if a single Indian citizen draws up a petition demanding it? The third and last example of a threat provided by Prof. Samdhong involves some “newspapers in South India” that report against the Tibetan Government-in-Exile “on an almost daily basis” (ha-lam nyin-ltar). True, some press reports and opinion pieces have been critical of Tibetan political activities in India. One was even demanding, in 2000, the expulsion of the Dalai Lama. But this phenomenon, not surprising in a country where freedom of speech truly prevails, does not happen on a daily basis — nor even on a monthly basis — as Prof. Samdhong wishes us to believe. Additionally, it is almost exclusively coming from The Hindu newspaper and its biweekly sister publication Frontline. However partial and hostile The Hindu is, its attacks are not as frequent as Prof. Samdhong describes and, with one exception, the end targets of these assaults are the political activities of Tibetans in India, not the name of their government. In July this year, an extensive search on Google returned about 5,500 articles on The Hindu’s websites featuring the word “Tibet”; the same search on The Times of India site returned 15,800 articles (both of these figures include multiple duplications). Only 238 of The Hindu‘s articles had to do with the Government-in-Exile (8,870 for The Times of India), out of which only three were opinions pieces calling for action. These called for India “to do more to restrain the anti-China political activities of the so-called Tibetan Government-in-Exile” (Oct. 2009), to curb “Tibetan separatist actions” (April 2010) and to “stop using terms and designations such as Free Tibet, Prime Minister, MP and Parliament” (March 2011). Only the last of these three articles, written in March this year by Dr. Subramanian Swamy, president of the Janata Party and a strong advocate of Hindu nationalism, actually insisted on a ban on some specific political terms. Given the date, it is probably the very article Prof. Samdhong had in mind and it might well be the very incident that triggered this hasty rebranding. Nevertheless, one article cannot make up for Samdhong’s plural form of newspapers (gsar-shog khag) or for his misleading reference to an “almost daily” frequency of negative articles. In 2008, Vijay Vikram, a Research Intern at the Institute of Peace and Conflict Studies, wrote an interesting research paper on the Bharatiya Janata Party’s (BJP) China policy. The tone of Vikram’s conclusion had little to do with the unjustified fears expressed by Dharamshala: not only did he conclude that “India needs to demonstrate its policy maturity on China by dealing confidently with the question of Tibet”, but he went further, stating that “it is necessary that the BJP realizes the potential of India’s moral position as the home of the Tibetan Government-in-Exile and fosters the next generation of charismatic Tibetan leadership.” More recently, Satbir Singh Bedi, a former Deputy Secretary of India’s Ministry of Agriculture, wrote a long article entitled “Government of India should recognize the Government of Tibet in Exile”, wherein he concluded that since Beijing has not agreed to the holding of a plebiscite in Tibet under international supervision, “the Government of India may then consider helping the Government of Tibet in Exile to throw away Chinese yoke in Tibet.” Why should these kinds of supporting opinions be discounted by Prof. Samdhong? It should also be clear that the Dalai Lama’s ambition in this rebranding was not to reconcile the English title “Central Tibetan Administration” with a proper Tibetan name as has been officially claimed. The new nomenclature sgrig-’dzugs is not a translation of “administration” (‘dzin-skyongs) but of “organization”, with a much softer resonance; the first conveys a sense of governance whereas the second only suggests the action of arranging and controlling. There is not the least bit of doubt about the intent of this rebranding: it is aimed at enshrining once and for all the concept of autonomy as the only goal of all Tibetans, regardless of their actual desires. The continued existence of a national government stands in contradiction, if not as an outright reproach, to that policy. Hence the surrender of the concept of Tibet as a nation. As Kelsang Gyaltsen bluntly puts it, “it makes clear beyond any doubt that the CTA is not seeking power to rule over Tibet.” This idea is clear in the minds of the Dalai Lama and some high-ranking officials (even if “mutual benefit“ is preferred to “surrender”), but definitely not echoed in the aspirations of the Tibetan people. And there is the rub. Logically, considering the true significance of this change, Middle Way proponents should have applauded the rebranding and the termination of the Tibetan Government-in-Exile. If Tibetans are preparing themselves for life within the framework of the Chinese constitution, a logical step is, indeed, to get rid of a national government and replace it with an organization responsible simply for supervising the return of refugees. I say “supervise” because the actual task of negotiating that repatriation would lie exclusively — as all attempts at negotiations already do — with the Dalai Lama’s envoys and representatives (whose titles have not been affected by the rebranding). I had a discussion with the Speaker of the parliament and now we are going to introduce an amendment in the upcoming parliament session, beginning from September 16 to October 1st, where we will introduce the Tibetan words bod mi gzhung gi ‘dzin skyong or bod mi gzhung gi sgrig ‘dzugs. 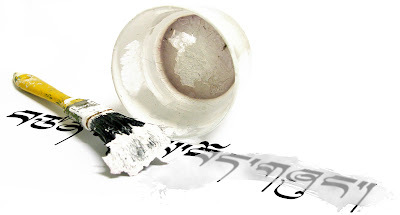 The term gzhung will most likely come back in the Tibetan Charter. Bearing in mind the true aim of this rebranding, the opportunity for such a parliamentary debate should not be taken lightly. As I pointed out, it is not only about political jargon but about the surrender of Tibet as a nation: it is the logical consequence of the disastrous policy formalized twenty-three years ago in Strasbourg under the name “Middle Way Approach”, and must be appreciated specifically within this context. Any attempt at overruling this constitutional amendment will be highly welcomed, but it would be worth little if it is not accompanied by a serious reconsideration of Dharamshala’s foreign policy. Without such a reassessment it would merely amount to another occasion for demagogic rhetoric, serving no purpose other than to momentarily please the Tibetan electorate. If Tibetans in occupied Tibet and in exile really oppose the demotion of their government to an “organization” — which I am certain most of them do — serious steps must be taken to ensure that their nation is not reduced to an “autonomous province”. With the 100th Anniversary of the Declaration of Independence on the horizon, it is time to stand firm and reject any kind of surrender.